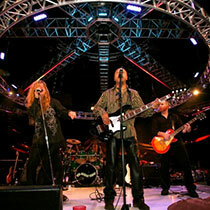 We have an incredible roster of A-List entertainment locally and globally that we work with for corporate events. Each act suggested is customized to the event itself, matching objectives, brand and expectations. We only work with the best and we are known for our creative approach in event entertainment production and execution. As a licensed booking agency, we are a one-stop shop for people looking to source cutting edge in event entertainment that has a proven, successful track record, without the hassle. Over the last decade Eclectic has built up an unrivaled, nationwide network of performers who are guaranteed to provide the ultimate in event entertainment. Our entertainers are hand picked for their professionalism, quality, image and reliability. We constantly strive to offer clients the most innovative, unique and best in event entertainment. We will always propose and offer the best event entertainment available in the geographical area of your event or conference. We also specialize in creating thematic event entertainment concepts with a focus on high visual impact. 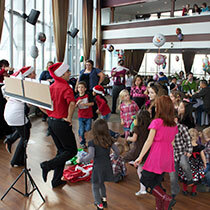 We have a number of popular thematic event entertainment concepts and we also custom-create themes for our clients. Want to pump the theme up even more? We provide stunning, breathtaking decor design. For family or children’s events you could choose from a wide variety of incredible event entertainment including stage shows, photo ops, Santa, costumed characters, thematic balloon decor, strolling entertainment, games, amusements, clowns (facepainting/balloon/magic), crafts, cookie decorating, Bear Factory, tattoo artists, and so much more. Specialty items such as photo booths of all kinds, candy buffets, aerial champagne pour and more are just a click away. If there is a particular type of performer you are looking for that is not in this list, please contact us as we can create the vision of your dreams with a custom event entertainment concept. If you can dream it, we can design and produce it! We strive to offer clients the most innovative, unique and best in entertainment. We will always propose and offer the best entertainment available. We can create the vision of your dreams with a custom event entertainment concept. If you can dream it, we can design and produce it!